Actor Leonard Nimoy, who originated the role of half human-half Vulcan Science Officer Spock on the original Star Trek television series, has passed away at age 83, due to end-stage chronic obstructive pulmonary disease. Obviously, I am deeply saddened to hear of the passing of Leonard Nimoy. Star Trek is not only my favorite television series of all time, but it has had a huge impact in how I think and perceive the world around me. The character of Spock, as delineated by the talented Mr. Nimoy, represented rationality and scientific curiosity. Logic - tempered with the best qualities of humanity. Loyalty... and sly, sharp wit. Qualities that I aspire to (and, admittedly, rarely achieve). 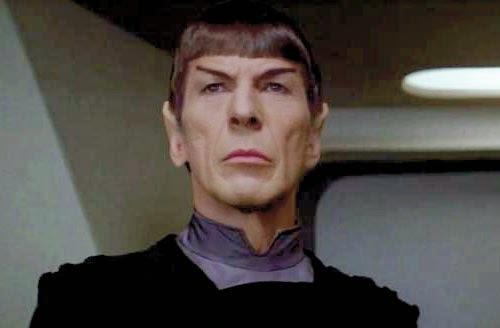 In the 1990s, I worked tangentially with Mr. Nimoy as the scripter of the comic book series Leonard Nimoy's Primortals. My direct interactions with the man were few - we spoke on the phone a couple of times and only met face-to-face on one occasion - but I have in my files a memo from him praising my writing on the series. Rarely have I been so honored by a compliment. A fine actor, writer and artist, his legacy will live long... and prosper. Among the plethora of promotional material created by 20th Century Fox for the original 1968 Planet Of The Apes were these two-color "door panel" posters for theaters, introducing various characters from the film. This kind of giant poster was fairly prevalent in the 60s (I've seen similar ones for the Bond films and other flicks), but became less common in the 70s as studios continued to cut costs on this kind of promotion. Enjoy. 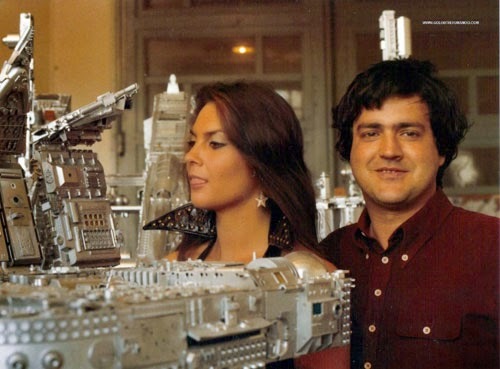 Star Caroline Munro and director Luigi Cozzi pose with the miniature of Count Zarth Arn's unique and menacing claw-shaped flagship during the shooting of the enjoyably goofy Starcrash in 1977-78. Universal's on a roll. Along with Gerry Anderson's Journey To The Far Side Of the Sun, the studio is releasing Douglas Trumbull's 1972 sci-fi parable, Silent Running, for the first time in HD in the United States on April 7th. It's about time! 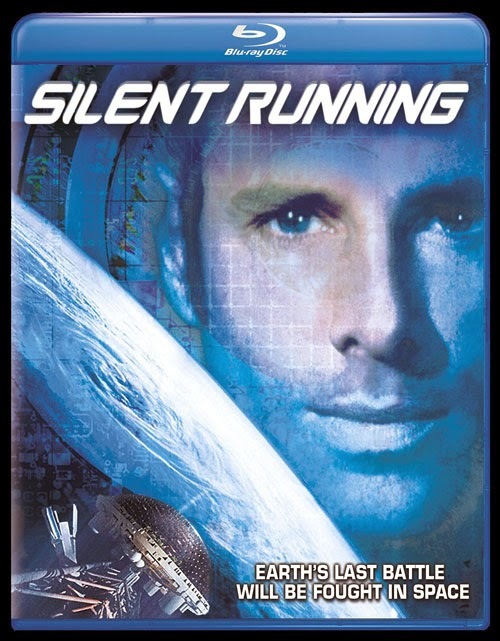 Academy Award nominee* Bruce Dern stars in Silent Running, a sci-fi classic that journeys beyond the imagination. Botanist Freeman Lowell (Dern) has spent eight years aboard the space freighter Valley Forge preserving the only botanical specimens left from Earth under huge geodesic domes. When he receives orders to destroy the project and return home, Lowell rebels and hijacks the freighter, while plunging the craft into the gaseous rings of Saturn. From that moment on, he has only the trees, the gardens and two “Drone” robots, Huey and Dewey, to keep him company on his greatest adventure of all. I'm pretty excited about this - Trumbull's effects deserve to be viewed in hi-def - but I still hate that cover art, recycled from the DVD release. The original poster artwork is so much better. Anyway, the Silent Running Blu-ray is available now for pre-order from Amazon ('natch). 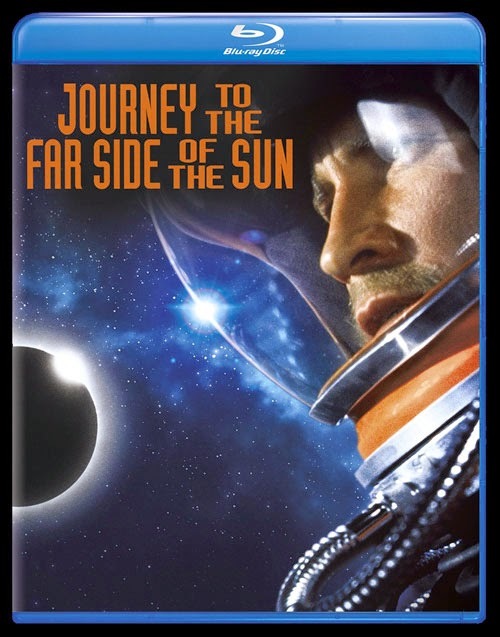 Space: 1999 creators Gerry & Sylvia Anderson's 1968 feature film, Journey To The Far Side Of the Sun (a/k/a Doppleganger), starring Roy Thinnes (The Invaders), is coming to Blu-ray disc in the U.S. on April 7th from Universal. Classic sci-fi adventure and suspense has never been more exciting as when you Journey to the Far Side of the Sun! One hundred years in the future, two astronauts are sent to uncover the secrets of a “duplicate” Earth on the other side of the sun. When they crash land three weeks earlier than they had planned, they must embark on a life-or-death mission to determine whether they have arrived back home or on the strange mirror world. This imaginative space adventure offers a journey few will ever forget! It's an interesting movie, with a dark tone and overall aesthetic that is very similar to Anderson's subsequent TV series, UFO. In fact, a number of the props, costumes and musical cues from the film (most notably the "futuristic" automobiles) showed up on UFO a year or two later, along with a few cast members. So far, no word on any extras, but I wouldn't really expect any from a Universal catalog title. The Journey To The Far Side Of the Sun Blu-ray is already available for pre-order at Amazon. There are numerous fan-made Star Trek series online. Some of these ambitious non-profit productions chronicle new adventures of the original U.S.S. Enterprise, others create their own starships and crews. The quality ranges from the embarrassingly amateur to remarkably slick and professional. James Cawley's Star Trek: New Voyages/Phase II is probably the best known of these, and over the years, his team have produced a number of reasonably enjoyable - if frustratingly uneven - Trek adventures . 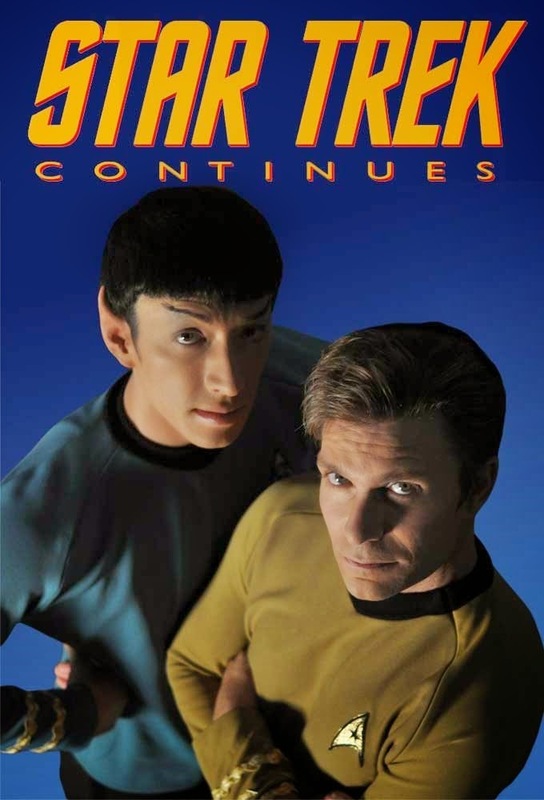 But, in my opinion, the very best at capturing the feel of the classic Gene Roddenberry series is Vic Mignogna's Star Trek Continues. The talented cast includes James Doohan's son Chris Doohan as Scotty and Mythbuster's Grant Imahara as Sulu. The sets, costumes, photography, music and overall production values are uncannily accurate, and the visual effects are terrific! Vic Mignogna, an experienced actor with lots of voice work to his credit, personally plays James Kirk, and he does a remarkable job of channeling the great Bill Shatner, capturing the man's distinct delivery while somehow never lapsing into parody (something even Bill finds hard to do these days). It's uncanny how well he captures Shatner's swagger. The first episode, "Pilgrim of Eternity," is a sequel to TOS' "Who Mourns For Adonais," with original guest actor Michael Forest reprising his role as Greek god Apollo (this one also includes a bit part by Battlestar Galactica Redux's Jamie "Apollo" Bamber.) The second episode, "Lolani," revolves around a fugitive Orion slave girl and her owner - played by Incredible Hulk Lou Ferrigno (in green body paint, of course)! The third episode, "The Fairest Of Them All," is a very well written direct sequel to the classic TOS episode "Mirror, Mirror," and it's another winner. A fourth episode has just recently completed filming, and although the title hasn't been released yet, it has been revealed that it guest stars the Sixth Doctor Who, Colin Baker. If, like me, you find the new Star Trek films by J.J. Abrams and company lacking the spirit and style of Gene Roddenberry's original show, I highly recommend that you check it out. In fact, the Star Trek Continues crew is midway through a "Kirkstarter" campaign to raise funding for additional episodes. They've already hit their initial production goal, but are now in the process of trying to raise enough money to build an authentic Engine Room set to complement their already astounding Enterprise sets. Episodes can be found on the Star Trek Continues YouTube Channel, and you can check out their Kirkstarter funding campaign here.